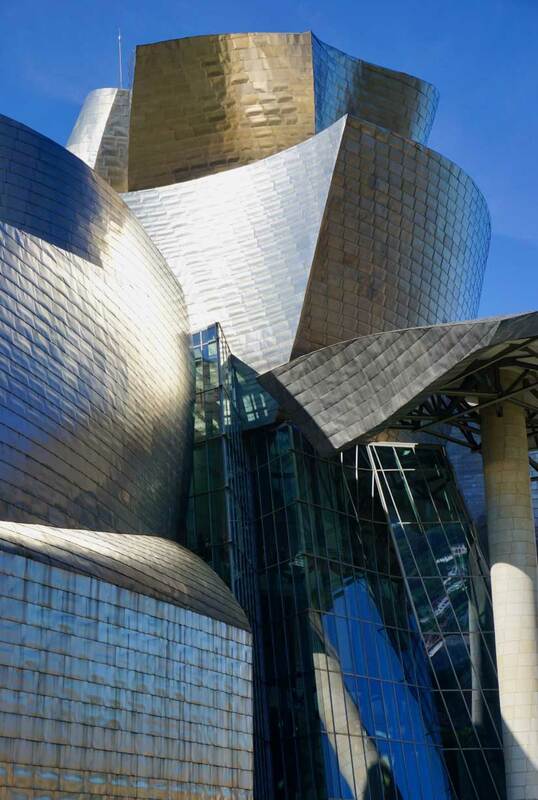 Rarely has one building defined inspiration and architectural genius more than anything that’s been before; Frank Gehry’s masterpiece, the Guggenheim Museum Bilbao, is frequently referred to as one of the greatest buildings of our time. 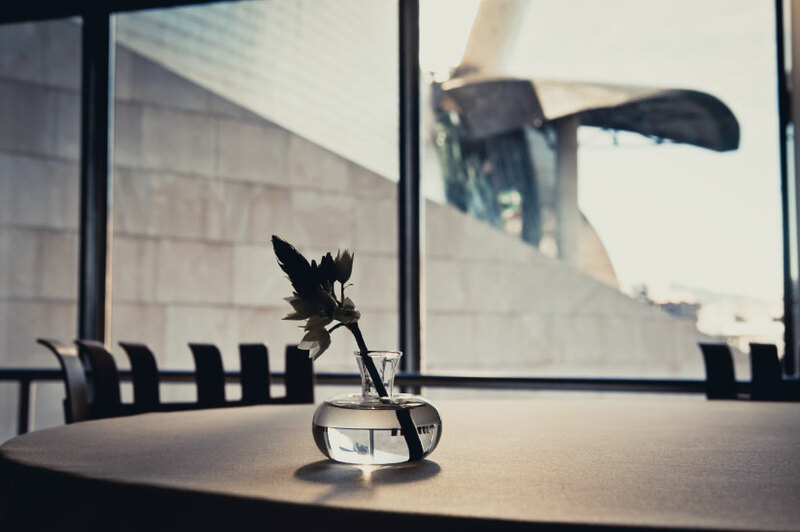 The building that rendered a seismic shift in architecture and global art culture could easily make some restaurants invisible, but not Nerua Guggenheim Bilbao. 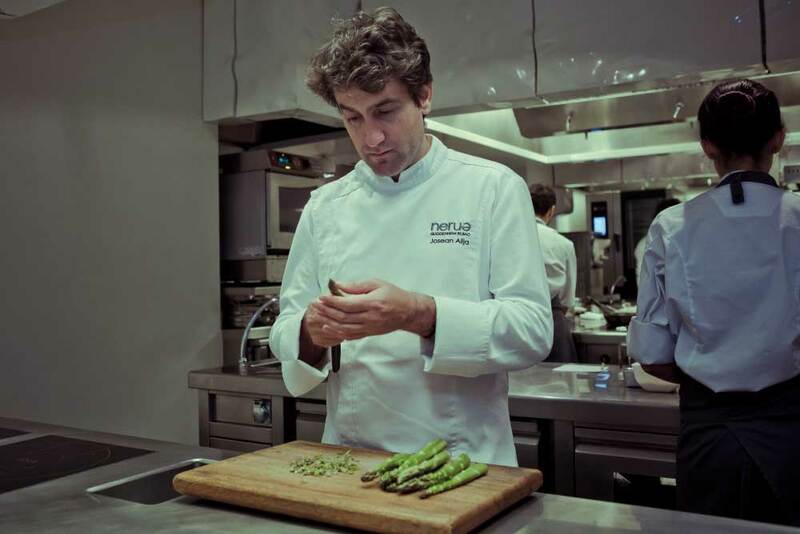 Head Chef Josean Alija, himself a student of one of the worlds greatest, most creative chefs, Ferran Adrià, is the creative force behind Nerua. Needless to say, Chef Alija’s cleverly considered cooking, the nueva cocina vasca (Basque nouvelle cuisine) is magnificent. 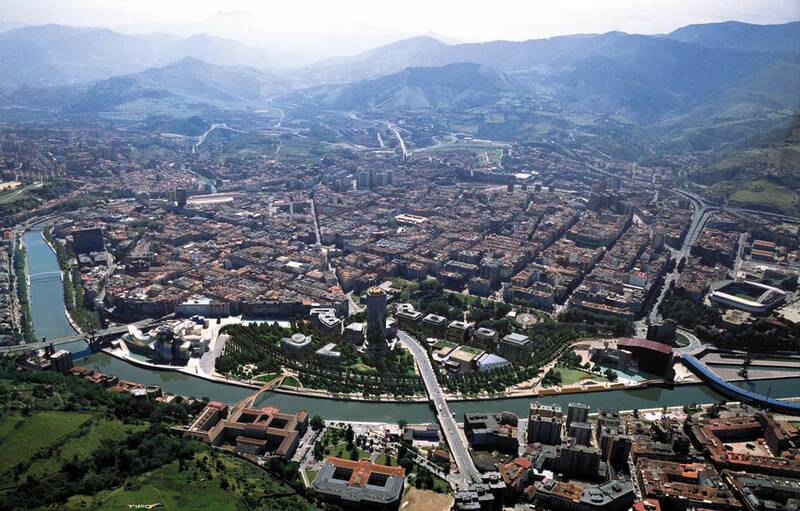 Nerua takes its name from the Nervión River, meaning the backbone of Bilbao. At the cutting edge of modern Basque cuisine Nerua is without doubt the culinary soul of Bilbao. 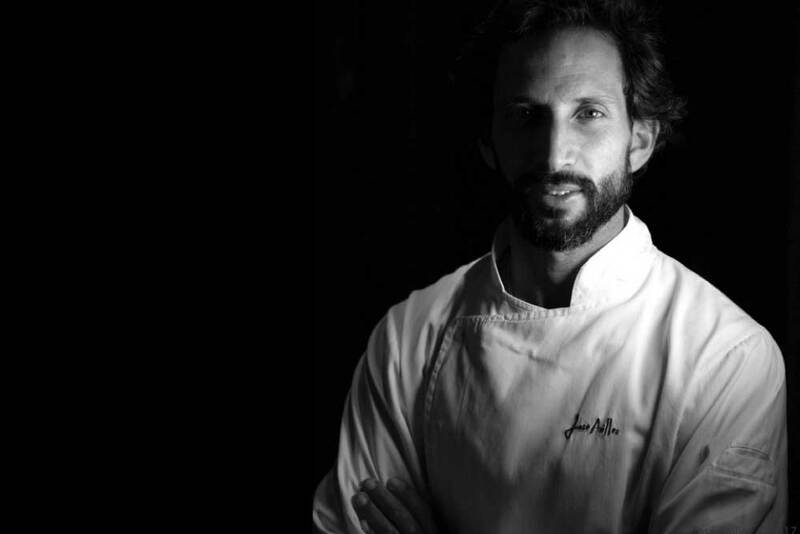 With an extraordinary chef, Josean Alija who has triumphed over what must have been the greatest adversity a chef could face, the loss of his senses of taste and smell in a dreadful motorcycle accident in the year 2000. 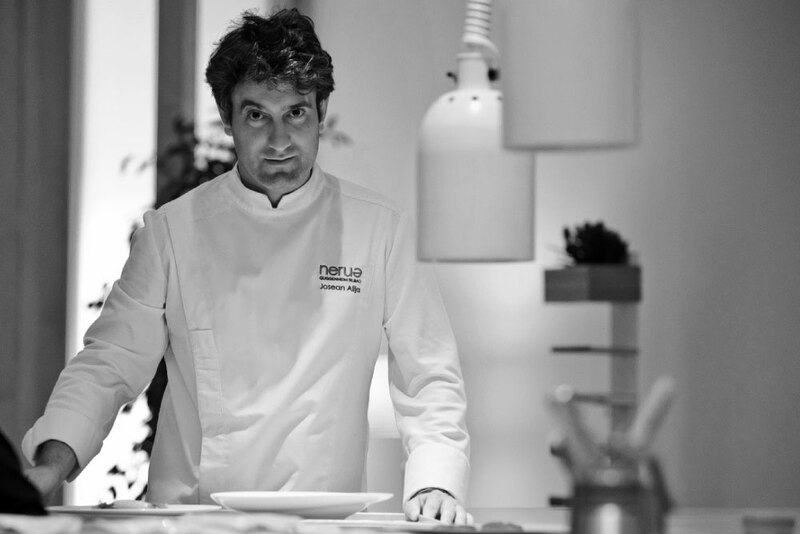 In 2009 Alija is acknowledged as the Best International Chef by Identità Golose and one year later he received the Award for Conceptual Innovation. In 2011, Nerua received its first star in the Michelin Guide and 3 Suns in the Repsol Guide. The International Academy of Gastronomy also awarded him the Prix du Chef de L’Avenir in 2011 (The Chef of the Future Award). In 2015, the prestigious magazine Restaurant included Nerua for the first time in its list of the world’s 100 best restaurants. In 2017, Nerua is in 56 in the prestigious list. The deep green coast of Spain is edged with lovely grey cliffs and looks very pretty. As we wind our way inland to the city centre we pass changing architecture. Smaller old houses soon give way to taller city buildings. It feels a lot like other cities, there isn’t anything particularly remarkable that is immediately obvious about it. Once in town we set off toward the river and our destination. At first the river feels man made and contrived with its concrete edges and many bridges. 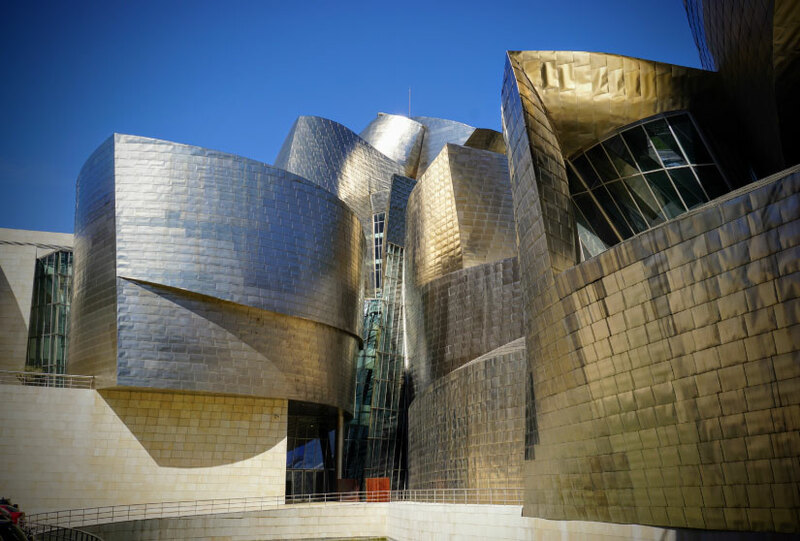 But then our first first glimpse of the Guggenheim Museum moves Bilbao suddenly from the ordinary to the extraordinary, which is exactly what it was intended to do. Bilbao was once a major industrial centre, seaport and shipbuilding town and was at one time considered the wealthiest part of of Spain. In the late 1980’s however the industry died when low wage competition in Eastern Europe and Asia saw the closure of the shipyard. Suddenly Bilbao found itself with high unemployment and significant poverty. 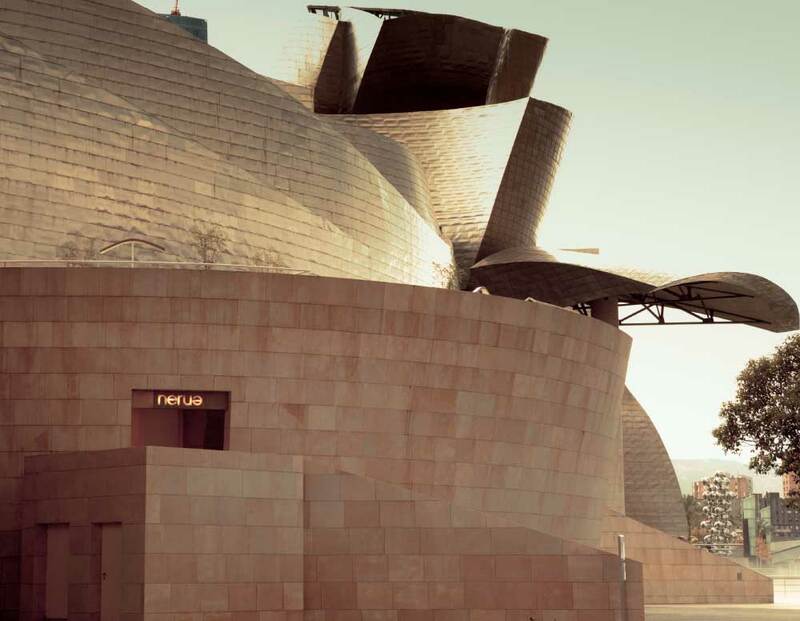 Rather than mourn the loss of what had been the town’s Identity, somehow the powers that be found another vision and set about redesigning the town to become a new vision of Bilbao as a cultural centre. 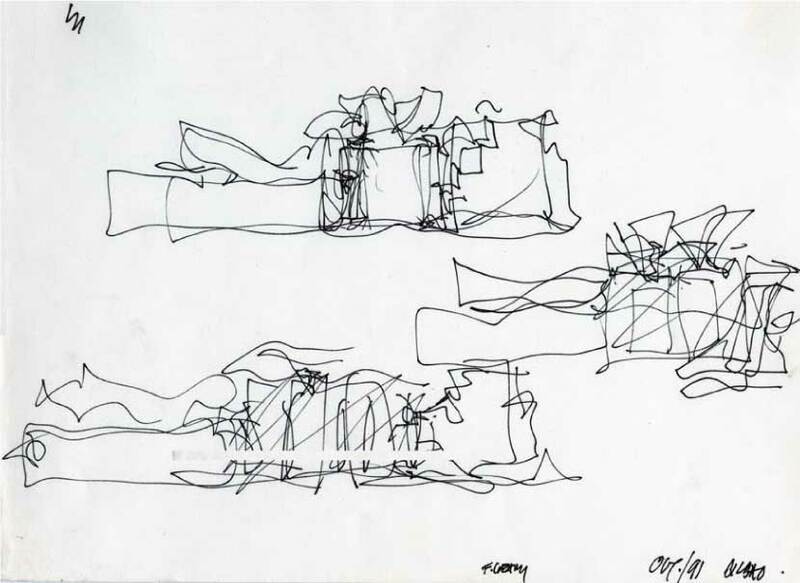 First they approached the Guggenheim foundation with the idea and then they engaged none other than Frank Gehry to design them a museum. I so admire an administration that truly appreciates and understands the importance of art and culture in a society. I wonder if they really understood just what a success the museum would be. 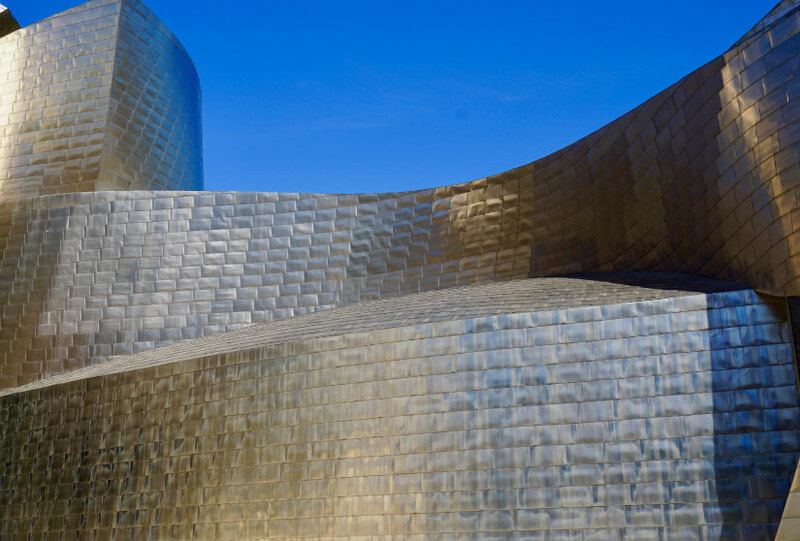 Since it was built in 1997 it has breathed new life into the city, receiving millions of visitors every year and putting Bilbao very much on the map as a cultural destination. What has been achieved here is incredible, so much so, that the phenomenon is now known as “the Bilbao effect”. 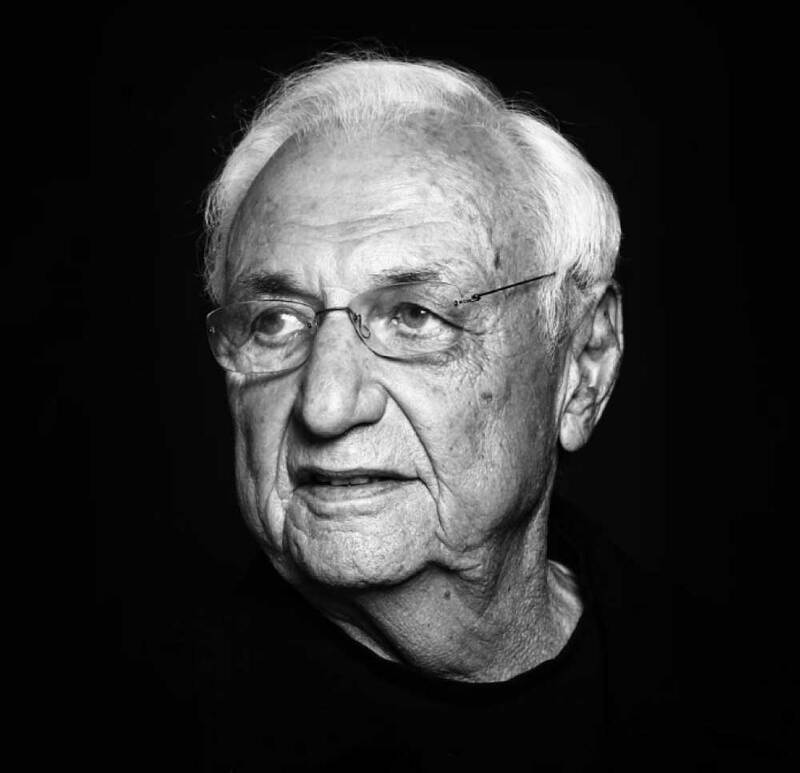 Frank Gehry fascinates me – that he has been able to let his imagination flow to create the most incredible buildings in the world, blows my mind. He doesn’t seem to start with the limitation of engineering requirements and design from there. It seems his is pure indulgence, letting his imagination run absolutely wild, juxtaposing curves and angles, fusing thin titanium, sandstone and glass to create surprisingly organic structures. It’s only then that the the poor old engineers get the unenviable task of figuring out how the hell to make the thing stand up! I love Frank’s acknowledgement of his Grandmother as a strong influence. As a child, she encouraged his imagination and together they would build little cities from all sorts of bits and pieces including things found at his grandfather’s hardware store. I seems she encouraged a freedom of expression, she apparently even let the kids bath with the goldfish swimming round in the tub on Friday nights! Little Ephraim Goldberg (he wasn’t Frank Gehry until he decided he needed to avoid anti semitism) must have had a lovely time with such a wonderful Grandmother. I very much relate to the importance of a wonderful grandmother. And here I am standing before the most magnificent building I have ever seen and the most poignant reminder of how important it is not to squash a child’s imagination and enthusiasm, to not try to squeeze them through the conformity sausage machine, let them be free. We slowly make our way around the museum, taking it in from every angle and watching how subtly the differing light adjusts the colour reflected by the shiny titanium coating. It is simply mesmerising. There are other exciting things to see as we go around too. Stunning street art under the Bridge de Salve; Maman, a 9 metre tall bronze, marble and stainless steel spider sculpture by Louise Bourgeois on the river’s edge and “Puppy” a 12 metre tall plant sculpture of a dog by Jeff Koons outside the front of the museum. Not far from the spider, on the river side of the Museum, we find a small discreet sign for Nerua . 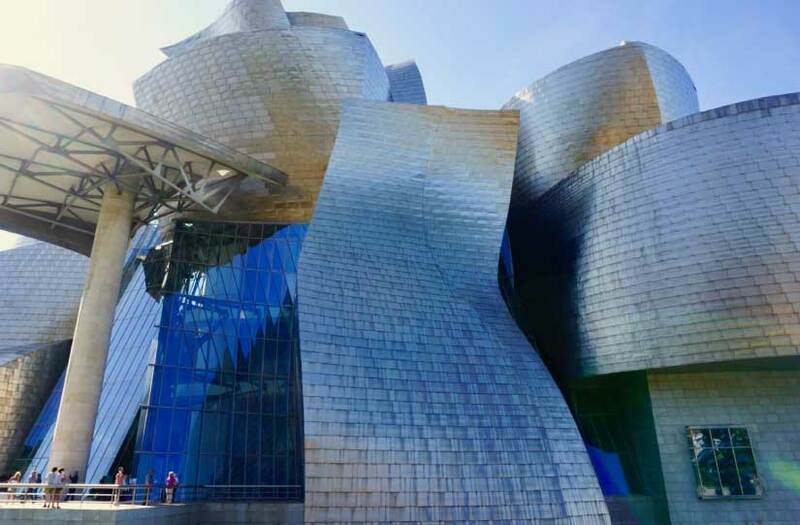 We sit and wait along with a few others for the doors to open enjoying every moment gazing at Gehry’s creation. 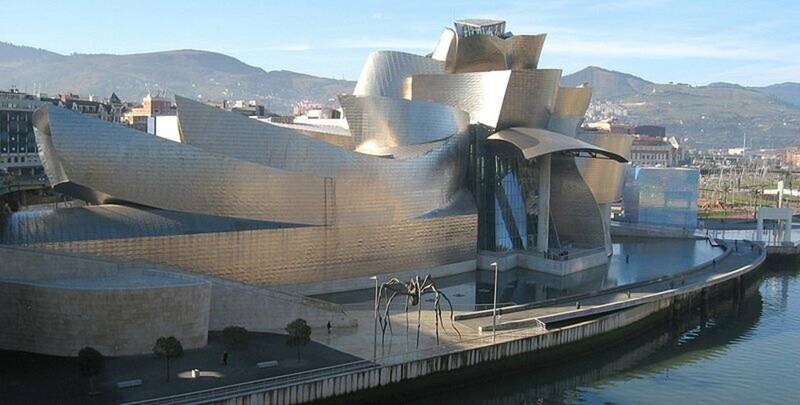 Gehry’s building has been included in a very select list of “buildings that have changed the world”. What a poignant location for a chef who has had to change his world of gastronomy. At last the doors are thrown open. Once inside we are given a wonderful and unexpected welcome. After the hostess takes our hats, we are greeted by a young man who takes us (not everyone, just us!) back to the kitchen where he sets the scene for our experience. He shows us the fantastic kitchen and talks to us about the philosophy of this establishment, offering delicious little amuse bouches by way of introduction. At Neura, nature sets the pace of the kitchen and the cuisine begins with what mother nature offers them each day whether it be from the gardens, the farmers or the fisherman. Chef Josean Alija knew from a very young age he was meant to be a chef. At the tender age of 14 years old, when most boys are preoccupied with their adolescence, this young man was beginning a career. One in which he saw the possibility to make people happy! His dreams were rudely interrupted in 2000 when he crashed his motorcycle and woke up from a coma 21 days later to realise that he had lost his sense of taste and smell. I can’t imagine how he must have felt, how can a chef possibly cook if he cannot taste or smell anything. I so admire that rather than give in to this cruel twist in his life, Josean set about finding a solution. For him the relearning of his artform became about research. He set about determinedly examining each product that was in season, learning everything he could about it, experimenting and perfecting his approach. Soon he was able to find his unique style born from the deepest of understanding of each ingredient. And so today his menu is simply about those products. As diners our choice is simply how many products perfected by Chef Alija we would like to try. After a very special and heartwarming welcome we are escorted to the dining room, or what feels like the main gallery. The very minimalist setting seems to align perfectly with both the philosophy of the chef and the fact that we are within the Guggenheim museum. It is a large white room with a small number of tables draped with white linens, spaced well apart beneath a rippled white ceiling. Warmed by pale blond timber floors and stunning crosscheck bent timber chairs designed by Frank Gehry. They are not only beautiful but comfortable. The walls are bare, a clear indication that the artwork here will be what is placed on the table. It is an exquisitely calm space. We enjoy a quiet moment, sipping some sparkles while we wait for the first of our fourteen products. Our first plate, a pretty bowl holding a selection of tiny tomatoes swimming in a clear consomme. Tomato tomato tomato it is simply and purely tomato. The consomme vibrantly sings with such a powerful fresh tomato flavour and each little tomato explodes with different herbaceous flavour as it bursts in my mouth. My goodness how on earth has he achieved this? I was so inspired by this dish that I have since played with making the clear tomato consomme and injecting flavours into little tomatoes. Great fun but the results no where near as exquisite ar Chef Ailja’s. Asparagus is one of things I didn’t eat fresh until I was an adult. I had only ever had that soggy grey canned business. I still remember the first time I had it fresh and what a revelation it was. This dish from Chef Alija is another whole level of revelation. Crisp wonderful asparagus spears, avocado, tissue paper thin shavings of cheese, peppery fresh arugula and a silky fresh chlorophyll emulsion that somehow enhanced every element on the plate to its full potential. Our next plate – Shrimp pod and peach arrived on a pretty grey speckled plate. The “pods” turned out to be a little mound of shredded young beans on top of which the shrimp rested. To finish the dish was dressed with a fragrant peach reduction. I don’t think I would ever have contemplated these ingredients as a flavour combination but it was incredible! The shrimp, very lightly cooked so they retained both their sweetness and natural tenderness were very very good and the peach, what a brilliant compliment. Every bite was simply delicious. Two little crayfish tails are the crowning glory for our next plate. They sit in a creamy white sauce called pil pil sauce in a gorgeous dark bluey grey bowl. Pil Pil Sauce is a traditional Basque sauce usually using salt cod, garlic and olive oil to create a rich emulsion. Slicing a kbite of the crayfish and scooping down into the bottom of bowl I discover the sirfried tomatoes hiding. A little bit of everything on my fork makes for a magic mouthful. A simple white deep sided plate is placed before us with little disks of something….and I have absolutely no idea what it is. Our server explains that it is tuna heart, cooked long and slow till it has achieved almost a firm texture. Like a prosciutto of the sea it is rather amazing and the tiny black Aragon olives are yummy! Anchovies are always a winner in our house, whether part of a dish or sneaking a fork full straight out of the jar. But fresh like we have today are simply unbeatable. Infused with the flavour of sage and with a perfect hint of crispy batter just hanging on to the edges and softened with a light foam of oat cream this anchovy is to die for. Just give me bunch of these and I would be very very happy! The first thing that that makes the next dish so striking is the restraint – simple yet arresting, a white bowl with only two tiny shallots bathing in a jet black sauce. There is something quite confrontingly beautiful about black food. First of all it is incredibly rare to see and it is impossible in the blackness to imagine what it might actually be. Our server explains that the shallots have been delicately smoked and poached in a rich mushroom stock. The glossy blackness has been achieved with squid ink and sea urchin. As I lift a spoonful to my mouth I am nervous and excited thinking about what this might actually taste like. Oh and very grateful to be wearing all black! Absolutely stunning, the smoky sweetness of the shallot and the most fascinating sauce, complex, light, hints of sweetness from the sea urchin and herbaceous notes. It is like nothing I have ever had before. I think chef Alija likes to make you stop and think and I love how he seems to connect you back to the source product that nature provided him to start with. The next plate is another visual moment like that. A dear little squid almost seems to be still swimming around as it is presented whole in its bowl of translucent green pea juice. I have tended to avoid the tentacles on baby squid as more often than not they have turned out to be chewy. This squid, however, is perfect from tip to toe. Beautifully tender, filled with sweet onion and with a hint of crispiness on the tentacles. The pea soup, so vibrant, is perfect. Belly meat from the Tuna is highly prized for its creamy melt in your mouth texture and unique flavour. There is only a small amount of it in each tuna so it is a priceless treasure that I have only ever eaten raw, Japanese style. We are presented with Tuna Belly confit. A beautiful glossy portion of fish that has been handled incredibly gently and with great respect. Served with a light, mild spring onion cream and garlic that perfectly complimented this very special fish. You can’t go wrong with fried fish. This gorgeous little morsel of hake is brilliant. Golden and crispy and with a little puddle of sauce with thin strands of “txoricero” pepper. The “txoricero” is a type of pepper that is an important part of Basque cuisine. The earthy slightly sweet hint that it brings to this little sauce creates a lovely warmth to the crispy fish. Oh my what a beautiful plate! The white ceramic so fine and thin it is almost translucent. its uneven delicately curved shape reminiscent of rose petal. Upon it a delicate morsel, creamy cauliflower puree topped with deeply flavoured and meltingly tender lamb cheek and anointed with a Manzanilla wine jus. a Manzanilla is a variety of fino sherry made around the port of Sanlúcar de Barrameda, in the province of Cádiz, Andalusia (Spain). It brings the most wonderful little hint of sweetness to this delicate sauce. Perfect with the rich lamb. Shades of white – that’s where the inspiration from the next dish takes my thoughts. We are in a white room at a white table with a white plate splashed with two different puddles of white, all providing a canvas for the tiny little quail that is the hero of the plate. It reminds me that nothing is really simple, that even white has many many tones flavours and textures all of which are wonderful. The Quail is beautifully cooked, a small morsel of tender rich meat. The white puddles, one potato and the other a sauce of almond and wheat juice are quite simple yet the creaminess of them makes this a very decadent dish. With the last of the savory dishes completed and having proved fascinating, we look forward to the excitement of dessert. Our first sweet treat is fig mint and iced figtree milk. I adore figs for me they are a wonderful fruit that is not overly sweet but rather complex in flavour. The big question is what on earth is fig tree milk? I imagine chef Alija out in a garden somewhere squeezing a fig tree udder, extruding the special milk. Turns out I’m not too far off. Apparently the sap of the tree is the milk and can work in a similar way to rennet, providing coagulating enzymes that can be used for cheese and junket making. Our iced fig tree milk is a gorgeously creamy yet light icecream affair that is just wonderful with the mint touched fig. And for our final dessert, a Carolina, a pastry bottomed dessert created in Bilbao many years ago by a baker who wanted to make something for his daughter who loved meringue. He wanted her to be able to eat it without getting her fingers dirty. Chef Alija honoured this Bilbao history today with a gorgeously light rose, coconut meringue and fragrant sweet strawberries. Black pepper is such a brilliant touch lifting the entire dish. Today has been a magnificent day. To me, architecture, design, art, cooking, cuisine are all creative expressions of being human. I cannot think of a more poignant place than here in Bilbao in one of the most creative buildings in the world for us to find one of the most creative chefs in the world. This experience has made so much sense. I leave feeling the enormity of Gehry’s work and the passion and humanity of Chef Josean Alija’s menu. His depth of knowledge of each product he presented today was evident. Each prepared in a way that highlighted what was important about it, flavours textures or colours. And accompanied by just the right things to lift, enhance or support the main product, letting it shine. It can be easy to let too much information overwhelm and constrain creativity. I have at times found myself over thinking an artwork when I have been working with a subject that I am very familiar with. What I particularly loved today is that while chef Josean Alija clearly deeply understands his products, it has felt as though that knowledge has set him free. Free to be expressive and bold in his combinations of flavours. As we walk past the incredible golden curves of the Guggenheim museum again it too speaks to me of freedom. Yes freedom, how joyful the freedom of expression is, is what I take away from this experience today.